Pronounced MOKH-er; be sure to use the German kh, as in "Ach!" From the German: machen, "to make", "to do." Someone who arranges, fixes, has connections; a big wheel; an "operator." I am happy to announce that over forty of my original works (a real rogues gallery!) will be on exhibit at The Ann Loeb Bronfman Gallery in Washington , D.C. 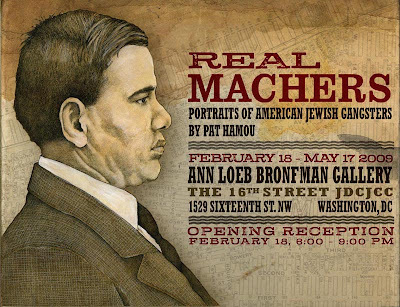 The show is entitled Real Machers, and the opening reception will take place on February 18, 2009, and the exhibit will run until May 17, 2009. There will also be a 'teaser' exhibition running at The National Museum of Crime and Punishment, also located in Washington, D.C., which will include five works. In conjunction with the opening reception, author Ron Arons will be speaking on his book, The Jews Of Sing Sing that same evening. 575 7th St. NW Washington , D.C.
Stay tuned for up to date info on the exhibit. In the meantime, I gotta get back to the drawing table!